“I come as an orphan to you, moist with love. I come without refuge to you, giver of sacred rest. I come a fallen man to you, uplifter of all. I come undone by disease to you, the perfect physician. I come, my heart dry with thirst, to you, ocean of sweet wine. enares – a strange and beautiful city, the most religious city of all, so entrancing, so mysterious. Pierre had often heard of this town, and now he was already treading its soil. Many people had advised him that it’s not a place to linger in. “You will be assailed by the rickshaws, the hoteliers, the merchants…”, said the tourist guides. So he was on his guard that morning, on leaving the station, and was preparing to fight hard with the hawkers and profiteers of all kinds. It was six o’clock in the morning and a beautiful day beckoned. His anxiety was soon dispelled. Everything seemed strangely calm and serene. There wasn’t here this traditional turmoil of Indian cities, nor the famous dust that envelops every city with a gray and dirty halo. An incredible clarity illumined the landscape. Oh! Of course! One had to endure, as everywhere else in this country, the innumerable calls of the rickshaw drivers, or the greedy shopkeepers. Gazes were as intense as everywhere else in India, students as curious, children as mischievous, cows as nonchalant, dogs wandering everywhere. 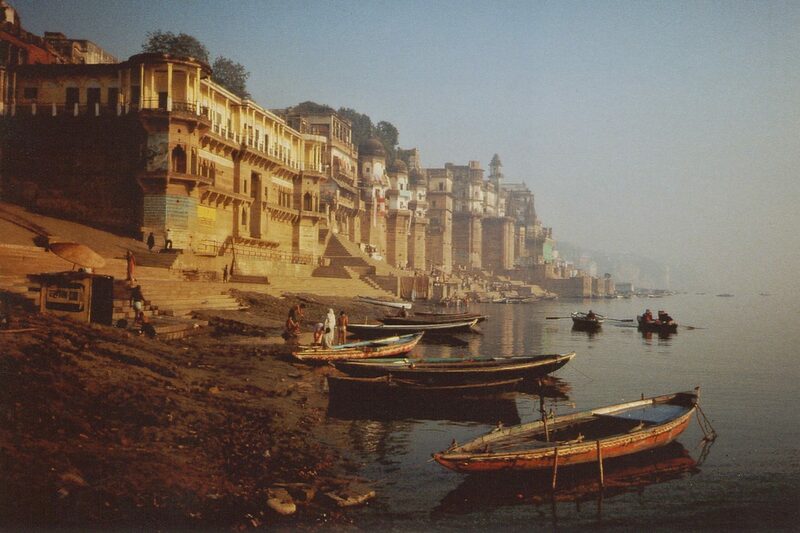 Everything was so marvelously the same as the rest of India, and yet Benares was not a place like any other. which runs through all experience.